I had never used a facial cleanser from Lush before, mainly because the weird blobs of solid ingredients freaked me out and I didn’t really understand how that was meant to go on my face. 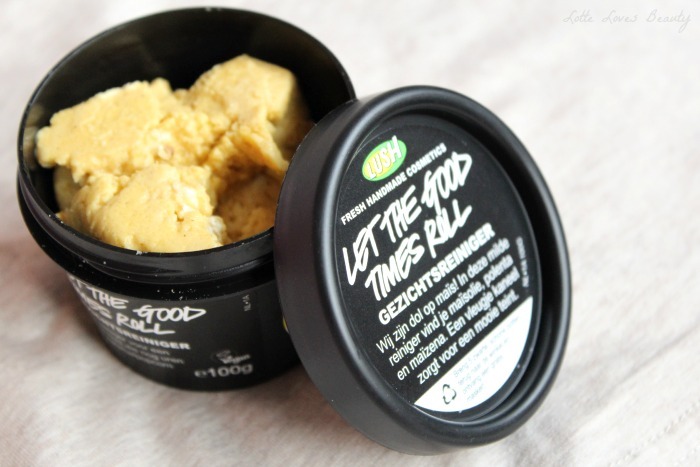 After being seriously curious about them for a while I decided to ask for a demo of Let The Good Times Roll, after taking a sniff of all of them and deciding that this one smelled the nicest. Hardly a good method of choosing the right skincare products but hey it kind of worked in my favour this time because I LOVE this cleanser. I initially asked for a sample only to be dissuaded by a slightly pushy sales assistant, to which I was not amused and argued my case that I should be allowed a small sample as I don’t know how my skin will react and if I will like it enough to want to buy a whole freakin tub of the stuff. She then offered me a demo and said that if after the demo I still was unsure she would happily give me a sample – I begrudgingly agreed. I really wanted to not like it so that I could spitefully insist on having my sample but I was pretty much blown away by how lovely my arm felt afterwards and the smell was divine and so I bought a tub praying that it would have a similar effect on my face. I am aware that facial skin is totally different to arm skin but I thought I’d try it out and if I wasn’t sure I could quite easily sell it on on Depop. As a person with combination skin I can struggle to get the balance right between mattifying and moisturising, this product basically takes care of that for me. Usually cleansers are a little harsh on my skin and can really dry me out – my previous routine was very product heavy and I used to cleanse and dry my face out using a kaolin clay mask before giving it a good scrub with some St Ives and then putting a moisturising mask on after to restore some of that moisture sans grime. This cleanser basically takes care of all three of those steps in one (although I am still partial to a good mask or two from time to time) while smelling absolutely divine. Made from polenta, maize and popcorn it has a sweet mealy smell that reminds me of caramel biscuits. To use this you simply take a pinch of the playdough-like goo and add a little water in the palm of your hand to make a paste, then take it and rub it all over your face in circular motions. The tiny grains basically act as a light exfoliator as well as picking up any dirt or oils with them leaving your skin nice and clean. Corn oil and cinnamon powder refresh and stimulate the skin leaving it silky smooth and more radiant looking – I definitely noticed that my cheeks were rosier and generally my skin looked really healthy. I only needed to apply a light moisturiser when it came to applying my makeup in place of the heavy moisturising mask I would usually choose, which did my skin a world of good as it no longer felt overloaded and heavy. I would recommend this cleanser to anybody with dry to combination skin, if you’re oily this might be a little too nourishing for you and could cause unwanted shine – but fear not, Lush are very accommodating to oily skin and Herbalism is great for you guys. I have only been using this twice weekly in fear of overloading my skin with too much moisture so this definitely isn’t an every day cleanser for me however I would definitely repurchase as it’s great for a little treat. Is there anything you guys would like me to review? Always up for trying new things.